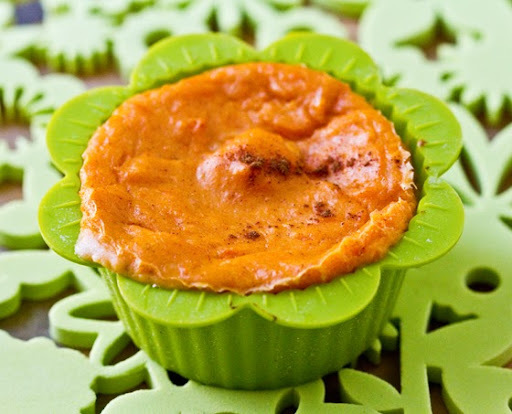 Sweet Potato Apple Soufflé Cups - Savory Sweet! 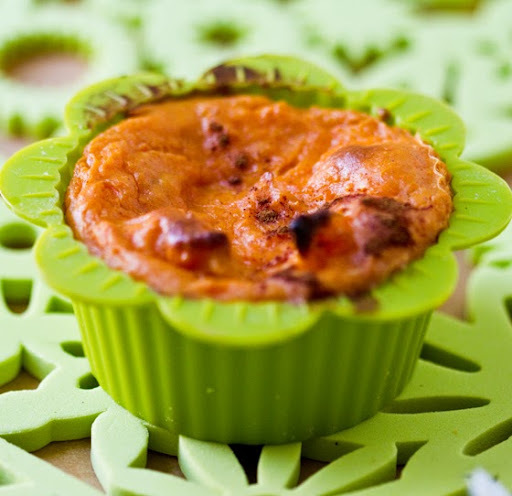 I was feeling creative when I whipped up (literally, whipped) this Sweet Potato Apple Soufflé - as a side dish for Sunday supper. Yup, that's right. I called it a soufflé. 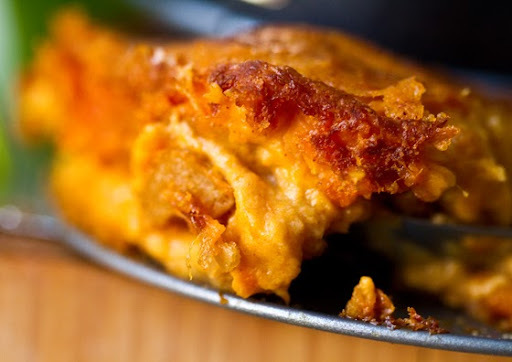 It's an eggless, vegan, no-sugar-added, naturally-sweetened, naturally savory, sticky-sweet, caramelized - sweet potato soufflé. 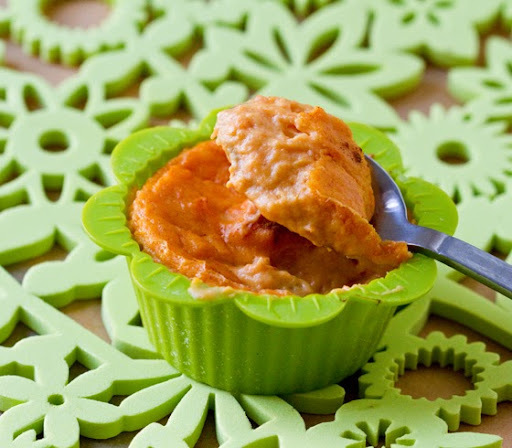 Get my recipe..
Sweet Potato Soufflé. Now I realize that by calling it a soufflé I am conjuring up highly respected images and taste expectations. I mean after all, a perfect souffle is the cornerstone of good-chefery. A soufflé is what separates the chefs from the cooks - or so they say on the episodes of Top Chef I have watched. But after my first bite of this recipe - I had to call it a soufflé! It was fluffy, creamy, whipped and silky - all I could think of was a puffy light soufflé. I'm sure you could even do a few tweaks with a vegan egg replacer and get it to rise a bit better than mine did - but for now, these tasty lil golden soufflé cups suit me just fine. 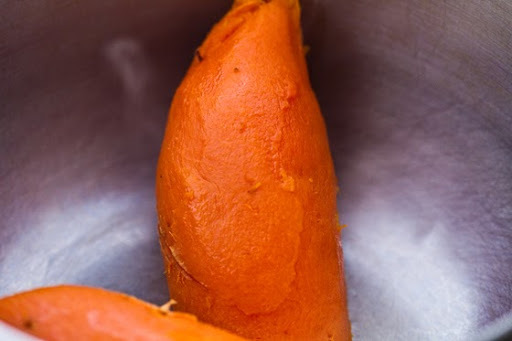 This recipe takes a traditional sweet potato mash and gives it the royal recipe treatment - it's like the Cinderella of dishes. shabby to chic in a matter of minutes. Yay, now I can serve my favorite food at even the swankiest of dinner parties! 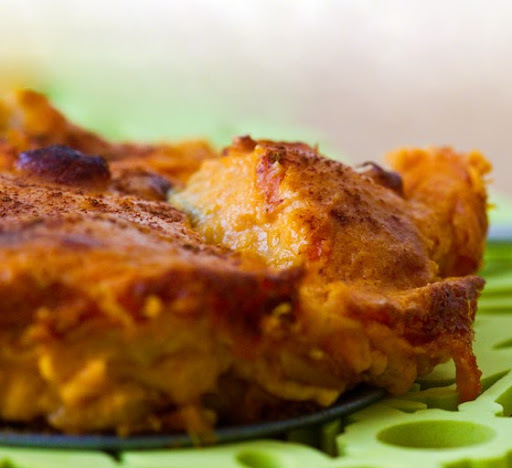 And you'll notice that this savory-sweet recipe is added-sugar-free! 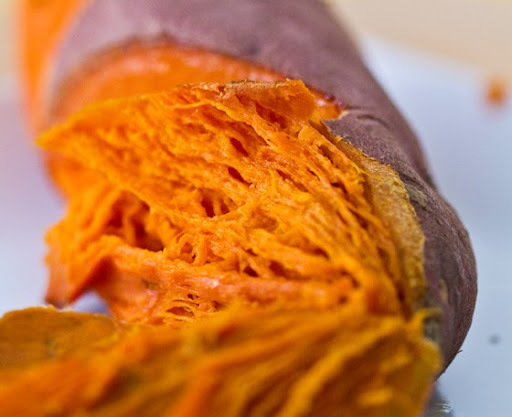 Nothing added to sweeten it - just the natural goodness of sweet potatoes leading the flavor profile. 1. 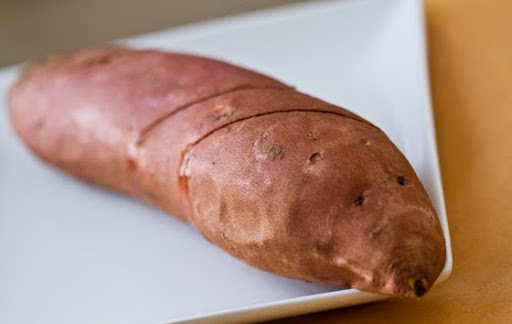 First bake your sweet potato in the oven. Rinse and slice venting holes across the skin. 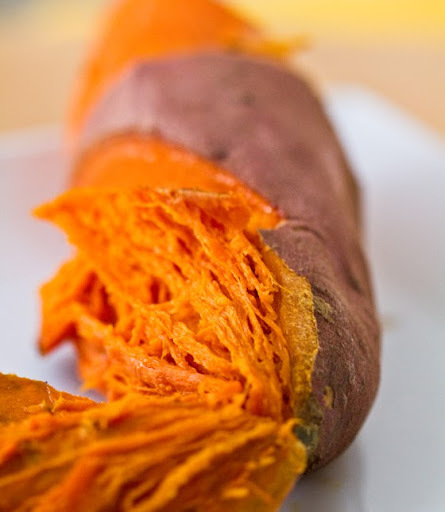 A large sweet potato will take around 40-60 minutes in a 425 degree oven. 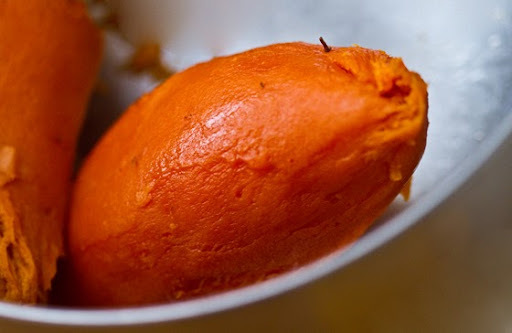 When the potato is ready it will be tender to cut down the center and the skin should fall right off the orange sticky flesh. 2. 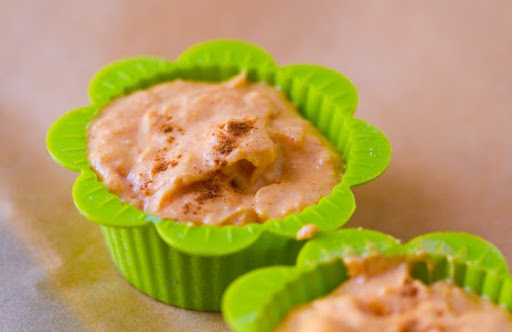 In a large mixing bowl, grab your hand beater and whip together the sweet potato, cream cheese, cinnamon, baking powder, salt, apple cider vinegar and olive oil. You'll notice the mixture is quite thick. 3. Dissolve your corn starch into your cold apple juice and then add the liquid to the mixing bowl and continue to whip the mixture - and let it loosen. Lastly, fold in your apple slices. 4. 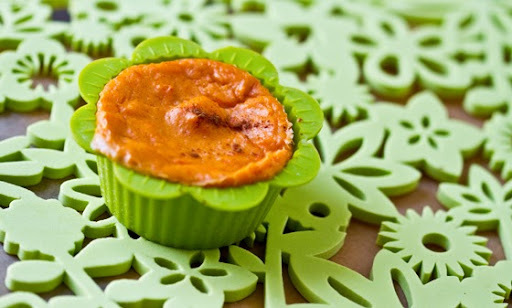 Prep your baking cups or soufflé bowls by rubbing them with oil and adding a thin layer of bread crumbs on the bottom. 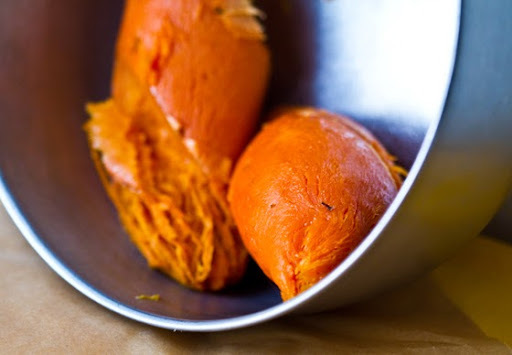 Then spoon the sweet potato mixture into the dishes. 5. Baking times will vary based on the dish size you use and how soft you'd like your soufflé. 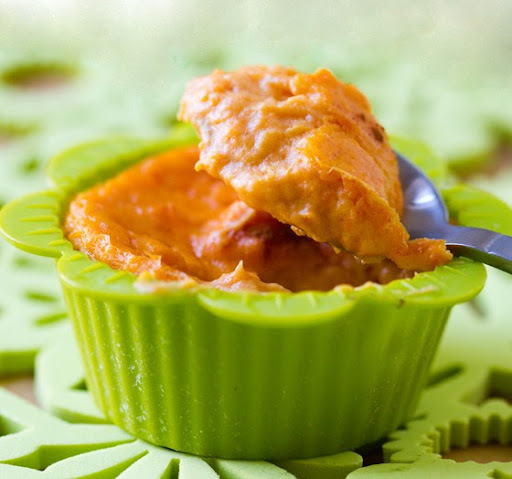 Small muffin cups (mini appetizer size) will take about 20-25 minutes at 400 degrees. 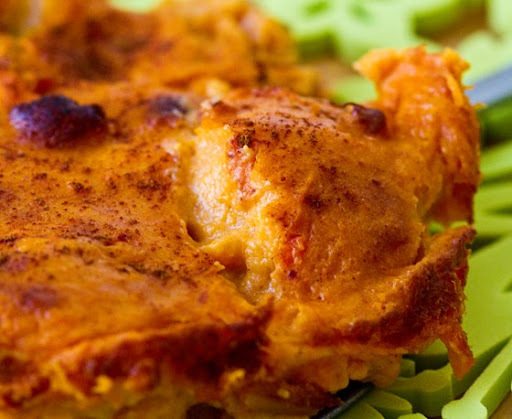 Larger soufflé dishes will take 30-60 minutes in a 400 degree oven. Good rule of thumb: when the top layer rises a tad and becomes browned, bubbly and stiff to touch - your cups are done. 6. Remove from oven. Allow to cool for a few minutes. 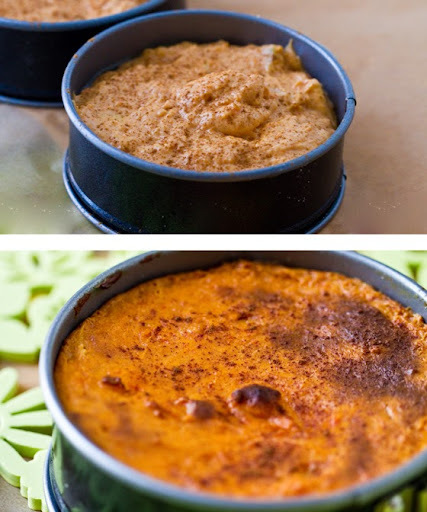 You can also allow the soufflé to chill and firm up in the fridge. These bites are delicious hot or cold! Store in the fridge.